Exposed: A Monarch No. 1. Variations in the Monarch line are extensive, especially among early models. These include labeling and feature changes in the No. 1 and No. 2 models. Accounting for these variations is not difficult. First, the Monarch was a “work in progress” — in other words, it was progressively improved during production. Second, it could be modified (apparently) by dealers after manufacture. A 1906 advertisement in a New Zealand paper boasts, “Each machine is fitted with a tabulator attachment.”1 Examining the internal workings of a basic-features model, one can see how certain functions — tabulator, backspace, and ribbon selector — could have been added, post-production. The words “Monarch Visible” are displayed on the faceplate of most, though not all, No. 1 and No. 2 models. In some instances, the printing is curved; in other instances, horizontal. There appears to be some logic behind this labeling scheme: horizontal, and the machine lacks a ribbon selector; curved, and the machine includes one. Curved label, machine includes ribbon selector (see upper, right corner). Horizontal label, machine lacks ribbon selector. 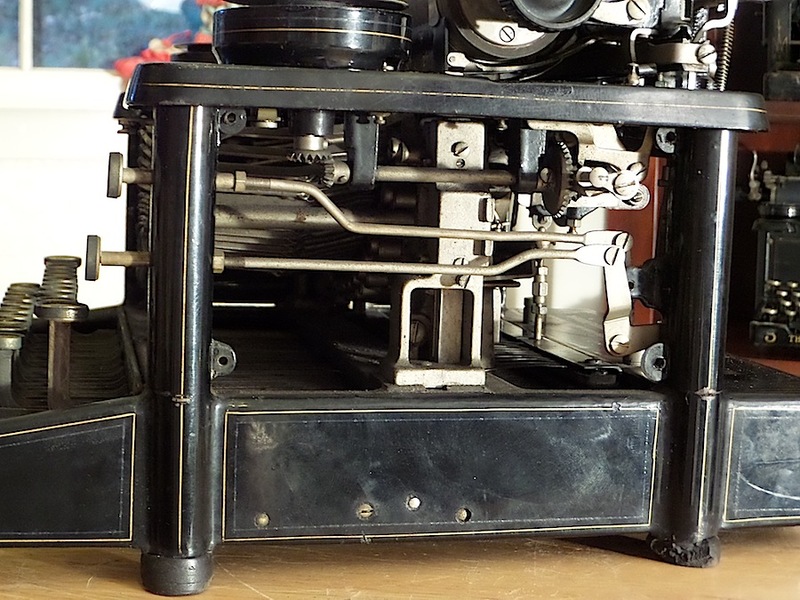 When I first wrote about the Monarch typewriter, I noted that some models lacked tabulators.2 This may be true in some instances, but more often it is the backspace button that is missing. 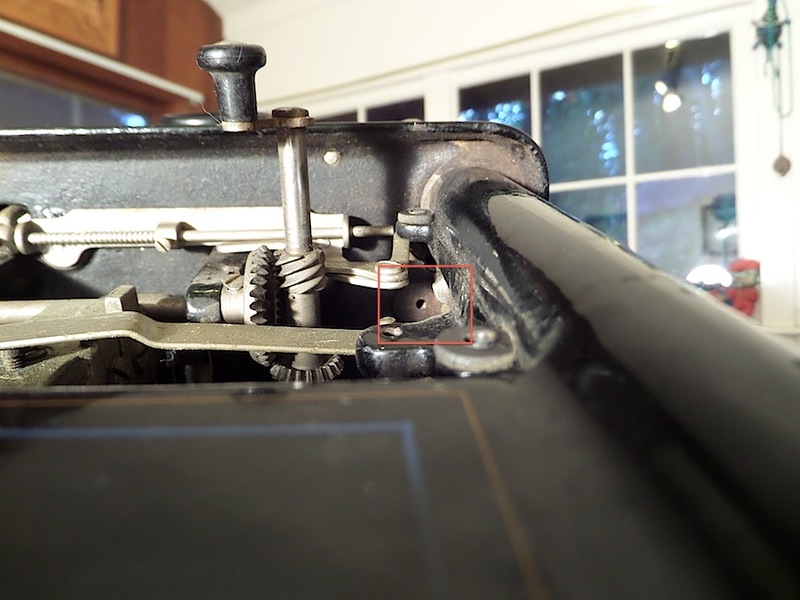 On those machines, the spot generally assigned for the backspace button is “rerouted” as the tab key. 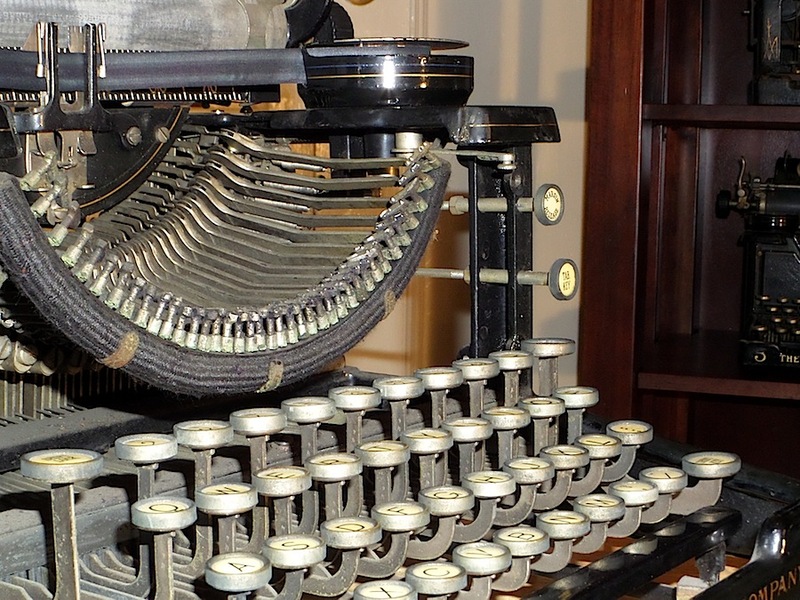 Such machines could otherwise incorporate a backspace button, as the frame includes guides for such an apparatus. 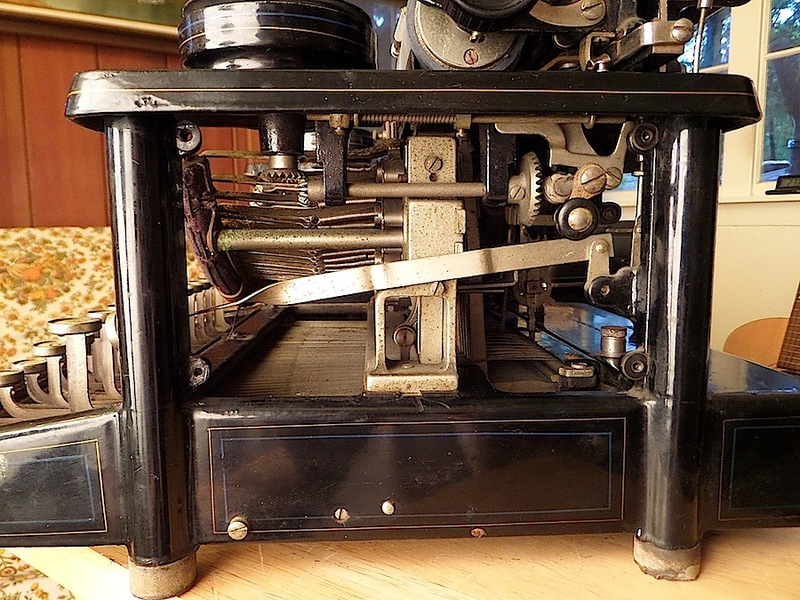 That ribbon selector, tabulator, or backspace were optional features on early Monarchs seems incredible; after all, one would expect such functionality on an office machine. But so it was. Peering into a basic model, one notices mounting holes for such functions, which, presumably, could have been added afterwards by a dealer. To note, by the development of the No. 3, such features came standard. Monarch No. 1, basic model that lacks ribbon selector or backspace, though frame could accommodate such features. 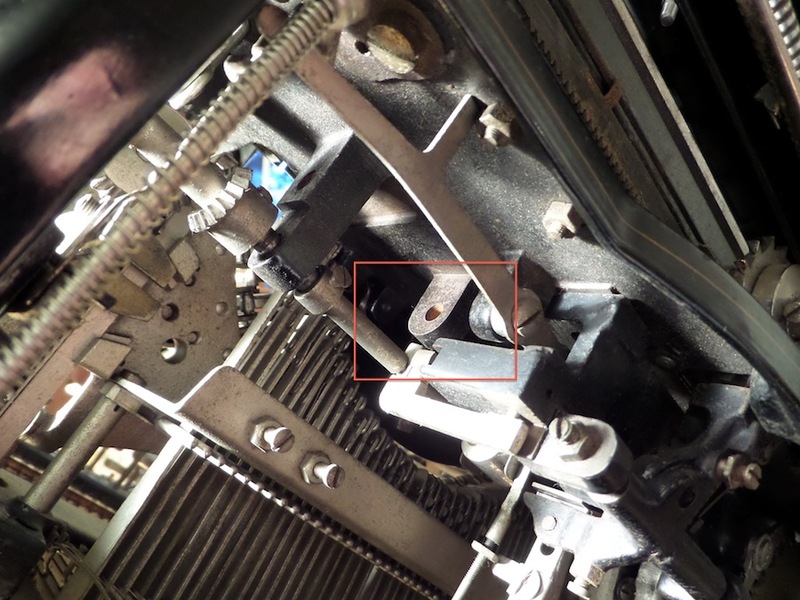 Margin release button attached to flattened rod that is not attached to internal mounting supports. Slot in faceplate keeps button in place. On subsequent models, rods pass through guides in frame of machine. © 2014, Mark Adams. All rights reserved. This looks fantastic. I am drained (sent 95 e-mails today) but will peruse this and compare it to my early Monarch when I have a little free time! 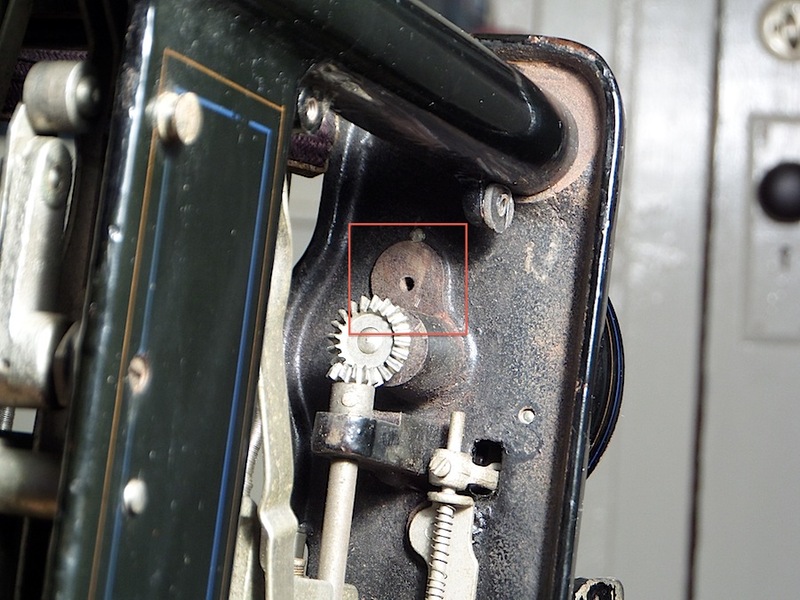 Given the drilled castings, it makes one wonder of the ribbon selector was available earlier as an upgrade? It’s difficult to imagine that Monarch manufactured different bodies/frames for models containing different features. (Yes, I am eager to hear about the insides of your machine, Richard – when you get a chance!) My guess is that the basic-features model was just a stripped down version of the standard model. Perhaps Monarch cut costs that way. Eventually, by the No. 3 model, Monarch dropped that pretense. After all, who wants an office machine that lacks backspace, ribbon selection, or tabulator, etc.? Doesn’t seem a good deal. I recently bought a metal case for a Monarch Visible from a friend. I can send photos to you if you want to use them on your Monarch blog.